Kick back and ride in comfort on the road to Hana. This tour is perfect for those on a tighter schedule. This tour is perfect for you and friends whether you’re about adrenaline and thrills or more laid back and easy going. Sandy Cheeks Tours can gauge and personalize any tour to any age, category and personality. 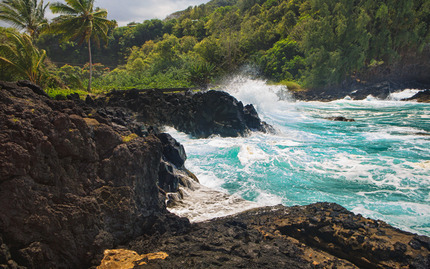 Hike and swim in secluded waterfalls, check out local fruit and farm stands, go cliff jumping, explore a fresh water cave, or stroll on the black sand beach. All in one day, on one awesome adventure tour. Kyle is the best travel guide in Maui and Sandy Cheeks Tours hana tours is not to be forgotten! Note: This tour is for 1 or 2 people. For additional passengers, please inquire about a private booking for this activity. Upon booking, please indicate if you would like to request an Escalade, Honda Pilot or an Outlander vehicle. Customers will receive a full refund with 48 hours notice of cancellation. Contact us by phone to cancel or inquire about a cancellation. No-shows will be charged the full price.